May 2014. Trees were cut at the site the second week of May. Media have been covering this story, lamenting the fact that the Class A heritage house is slated to be demolished to make way for a 17-storey tower. But much of the reporting is a little off focus or incomplete. This was not as simple as a choice between heritage or tree protection and there was no reason for the City to grant the request for a 17-storey tower. The City could have limited the height of a development to a maximum of 6 storeys and the density to 1 FSR (vs. 2.2 FSR). The maximum height and density under “discretionary zoning” should be used to reward good development – not to encourage demolition of heritage. The Development Permit Board (which consists of three City employees — Director of Planning, the Director of Social Planning, and the City Engineer) issued a building permit at the maximum conditional density, even though it included the demolition of an A-List Heritage building. December 7, 2011. In an upcoming meeting, the members of the Development Permit Board (DPB) will decide whether or not to approve the development application for 1241 Harwood Street. The applicant wants members of the DPB to approve the construction of a 17 storey condominium tower. When making this decision, Board members consider the input of the Vancouver Heritage Commission, the Urban Design Panel and the concerns of the residents and visitors in the West End. New designs are on the City website. Official information is here (including text, plus various views of the new proposal). See also the Development Permit Staff Committee Report, November 16, 2011 that will go to members of the Development Permit Board for discussion at the upcoming meeting. If you wish to influence changes to this application, you must send in individual written submissions by December 9th if possible and/or attend the meeting on December 12th to make a short speech (no more than 5 minutes long). You can see a Sample Letter for 1241 Harwood Street. Send written submissions to Lorna Harvey (Assistant to the Development Permit Board). You can also register with her to speak at the hearing. Her email address is lorna.harvey@vancouver.ca. Ms. Harvey’s telephone number is 604 – 873 – 7469. Heritage Vancouver has raised serious concerns about the demolition threat of the Legg Residence. In it’s words, it is your last chance to give input into the demolition of the Legg Residence and to send a clear message to Vancouver City Council that you strongly oppose the first demolition of an “A” Heritage Building in the City of Vancouver since the Georgia Medical Dental Building in 1989. Following the public outcry that surrounded the dramatic demolition of the Georgia Medical Dental Building, City Council introduced a policy to prevent the future demolition of “A”-listed heritage buildings. See the Heritage Vancouver site to get their perspective on this issue. The applicant is for permission to build a 173 foot high – 17 storey building with a floor space ratio (FSR) of 2.2 (a floor area 2.2 times bigger than the site current area). Under the development guidelines for the West End, any building with a height of more than 110 feet should be separated from the existing 12 storey building at 1219 Harwood by at least 400 feet. The proposed building is only separated from the building at 1219 Harwood by 123 feet. City development guidelines for the West End permit only one residential tower on each “block face.” There is an existing tower at 1219 Harwood that is close to this height and that would limit the approval of new towers at this location. The developer indicates that the existing building is just over 109 feet high while in a a previous report, the City indicates that the existing tower is 110 feet high. There appears to be a discrepancy. The current proposal includes 36 condominium units in a 17 storey tower with 8 rental units in the tower due to the demolition of a heritage house and the elimination of the current rental apartments. There are privacy issues associated with the proposed building since residents on the upper floor of the proposed 17 storey tower will be able to look into the courtyard of the building to the west and into the balconies and windows of surrounding lower buildings. If the proposed 17 storey building is constructed, a future strata corporation could apply to the City to have the historic tulip tree removed – the City needs to require that the applicant register a “restrictive covenant” on the property to ensure protection of the tree as a condition of development. In the previous proposal under the development permit application, the public benefits summary states that the applicant’s proposal to preserve a Class A 1899 heritage house is the main public amenity – with the demolition of the heritage house, are the 8 rental units in the proposed tower under the current proposal equal in value to the loss of a heritage house that Vancouver Heritage Commission members voted to preserve by supporting the construction of a tower with a smaller floor plate and retaining the historic tulip tree (October 24/11)? The existing gardens will be replaced by a large paved “drive court” with underground parking adjacent to the Harwood Street sidewalk that will create a landscape issue. A 17 storey building with a “fortress-like” appearance from Harwood Street will reduce the sense of pedestrian comfort on the street for residents and visitors. A low-rise development proposal has far greater chances of reducing shadowing and privacy impacts on neighbours and providing a development that complements the existing neighbourhood character. There is a strong argument for requesting changes to this proposal. This proposal fails to protect heritage and the issue of the height discrepancy supports the need to limit this current proposal to less than the maximum conditional floor space ratio and height that the applicant is requesting the Director of Planning to approve. The current proposal maximizes condominium revenue and increases negative impacts on neighbours. The cost to heritage, the FSR of 2.2, and the shadowing and privacy impacts are all too high. What is needed is a development proposal that meets the objective of balancing heritage retention (house and tree) with neighbourhood character and liveability impacts (shadowing, privacy, landscaping). Given these conditions, this project should be limited to the outright permitted maximum density of 1.0 FSR (a building floor area equal to the property site area) and a height of 6 storeys or 60 feet. According to the zoning bylaw (section 4.3 (a)), the City should only allow increases in the maximum conditional floor space ratio (FSR) and building height for the proposed project when the concerns of neighbours with regards to neighbourhood character (including heritage), shadowing, privacy and landscaping are met. 1. Speakers should register by contacting Lorna Harvey using her email address or telephone number. When registering to speak, give your first and last names. Speakers can register prior to the meeting of December 12th and on the morning of December 12th. During the meeting, any latecomers who want to speak but have not registered will be given an opportunity to deliver their speeches. 2. Development Permit Board meetings are conducted in a respectful and polite way without the presence of politicians. The meeting environment is comfortable. 3. When delivering a speech, give your first and last names. You may also give a general indication of where you live. An exact street address is not required. 4. When sending a written submission, include your first and last names at the end of your comments. 5. If you have additional questions, please contact Ms. Harvey. She is friendly and helpful. October 3, 2011. Many neighbours have indicated an interest in what goes on at the site of the heritage house and tulip tree at 1245 Harwood. New designs are on the City website. Official information is here (including text, plus various views of the new proposal). Since the May 2011 Council Meeting when this case was last discussed, the architect Bing Thom has developed a new proposal with less density and submitted it as a standard development proposal (NOT a rezoning) for the site. The new scheme is still for 17 storeys, but does NOT preserve the house. The tree remains standing (but is not legally protected). The building design is based on a floor space ratio of 2.2, which is permitted under the existing zoning — but only if certain conditions are met (watch carefully how planning staff and Council evaluate those conditions on behalf of the public): a building with the maximum conditional floor space ratio of 2.2 and height of 17 storeys (173 feet or 52.7 meters) should only be permitted when the concerns of neighbours with regard to issues like shadowing and privacy are met – if not, the building should be limited to a floor space ratio of 1.0 and a height of not more than 6 storeys (60 feet or 18.3 meters). See zoning details further below. A Public Open House will be held on Monday, October 24, 2011 at Gordon Neighbourhood House (1019 Broughton) from 6:30 to 8:30 pm. The Zoning information is here. The relevant sections of the zoning bylaw are section 4.3.2 (regarding height) and section 4.7.1 (regarding floor space ratio). Development requesting the conditional maximums under the RM-5A zoning should be complying with the development guidelines. As mentioned above, a building with the maximum conditional floor space ratio of 2.2 and height of 17 storeys (173 feet or 52.7 meters) should only be permitted when the concerns of neighbours with regard to issues like shadowing and privacy are met – if not, the building should be limited to a floor space ratio of 1.0 and a height of not more than 6 storeys (60 feet or 18.3 meters). (May 17, 2011). Click here to open PDF on your screen, or right-click on mouse to download.) (http://vancouver.ca/ctyclerk/cclerk/20110517/documents/phea5.pdf). June 1, 2011. On May 31st, the City Council voted to send this application back to staff for further work. The Georgia Straight covers the story here. Vancouver Sun also covered the story, but the article has many fundamental errors of fact, which we will seek to rectify. WEN believes that this is a complex case. The City has certain tools to protect heritage and the tulip tree. Neighbours have rights and opinions. The property owner and proponent (architect) have certain rights and obligations. The bottom line is that the City Council and departments have an obligation to protect the public interest, and we hope that after hearing the information on this application, they can show the public that they are making a fair and proper decision. Heritage Canada description of site as one of Canada’s historic places here. Density bonus debated for West End property. “Council looks at incentives for developer to preserve century-old tree” (The Straight, 13-May-2010). “This is about a tulip tree that knows no property lines.” Article here. Is this the planet’s most expensive tree? (Miro Cernetig, Vancouver Sun, 9-June-2010). Article here. Wonderful photo and heritage description of the site is here. May 31, 2011. Voting in Council resulted in this application being sent back to City staff to talk to the parties concerned and seek a way to save both the heritage house and the tulip tree. May 19, 2011. After hearing speakers at the public hearing on May 17, and May 19, Council now waits until May 31 to make its final decision on this application. Public may still send comments to Mayor and Council until noon on that day. May 3, 2011 The City of Vancouver has put out this notice that on May 17, 2011 at 7:30pm, City Council will hold a public hearing to consider the proposed Heritage Revitalization Agreement and Heritage By-laws regarding 1241 Harwood. March 2, 2011 On February 28, the Vancouver Heritage Commission reviewed the proposal for development of this site. The Heritage Commission appears to have endorsed the proposal to preserve the existing heritage house through the addition of an 18-story luxury condominium tower on the site. A Public hearing will be required as a Heritage Revitalization Agreement is involved. January 21, 2011 The Development Permit application at 1241 Harwood Street, site of the heritage house and heritage tulip tree, has been scheduled for review by the City’s Urban Design Panel on Wednesday, January 26, 2011. This item is currently first on the agenda and should begin at about 4:15 pm. More information on the role of the Urban Design Panel, can be found on the city’s website. December 3, 2010. The City has received a Development Permit Application from Bing Thom Architects to build an 18 story tower at 1241 Harwood Street and to rehabilitate and relocate the existing heritage house. The application includes the removal of a 107 year old tulip tree. The applicant team will make a formal presentation starting at 6 pm. 604.873.7621. Save 107 yr old tulip tree. a total floor space ratio (FSR) of 3.7, which includes both new and existing floor area. For more information, see the Notification Letter. Find out information about the application at the City Development Services for 1241 Harwood Street. A Century-old tulip tree planted 1903 and a heritage house are located on the site. Called Eastwood Place, this property is one of the rare surviving examples how the West End looked at the turn of the last century. It was evaluated when the heritage registry was first created in the early 1980s. It was classified as a Tudor building and then in 2007 it was reevaluated and given an “A” status on the registry. It went to the Heritage Commission and they endorsed the change in the property’s category. 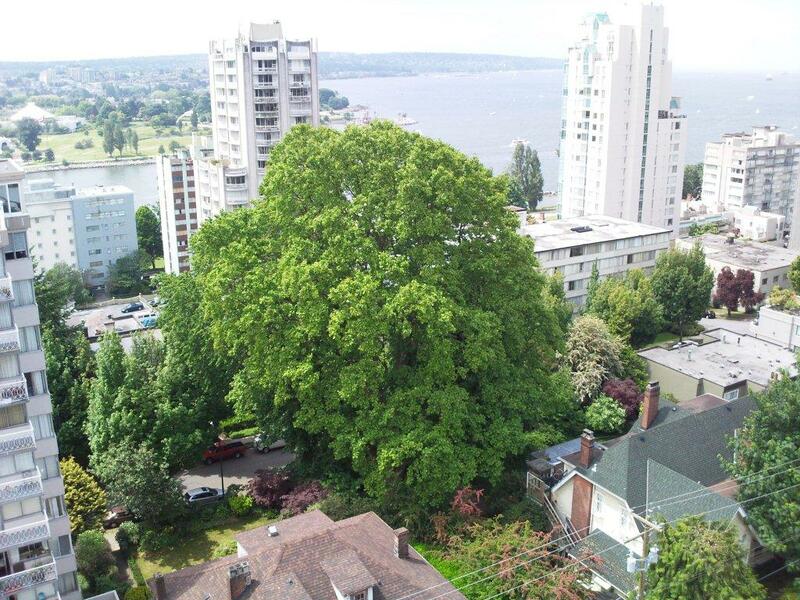 There is a very rare tree on the site, considered to be one of the finest examples of heritage trees in Vancouver. The tulip tree was added to the property at the time of construction in 1903 and is now 150 feet in height. This is the information from the Urban Design Panel. You can see an illustration of the current building and tree here. You can find out more about this important heritage site at the Canada’s Historic Places website. Please contact Scott Barker, Project Facilitator directly if you have any questions or comments.